One of the most common puzzles is the Rubik 's cube. A huge number of varieties of this toy. It and cubeand and snake, and balls, and pyramids. The invention of a Hungarian architect not only allows you to develop spatial thinking, but also just "kill" time, solving the puzzle. Choose a color that will collect first. Determine which side should be placed face with this color. To do this, simply place a finger on each corner of the pyramid, on the side which are the elements of the selected color. On the corners of the other side, where you will be put 3 fingers on the other side and should be the selected color. 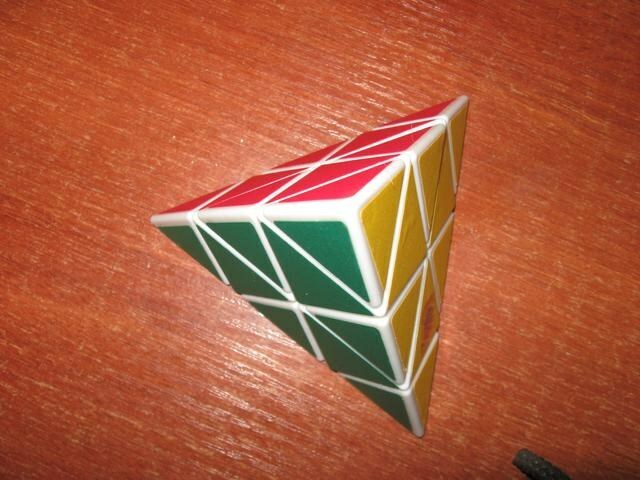 Take the pyramid so that the left and right side were different colors, to build the first combination. It cells different colors are on adjacent faces. Run the following turns of the parties: PPR, DM, PP, LP, VP, LP, VPR, LPR. Take the pyramid as in the previous step and follow the sequence: PP, VP, PP, VP, PP VP, PP. This is the second combination, when elements of the same color are not in their places. Do the following, taking the pyramid, as in the steps above: PPR, VPR, TM, VPR, PPR, VPR, PP. This combination is similar to the previous one, with the difference that the different elements are on the sides not his color. Use the following combination in the case where the two parties do not have enough of one color, and on one side two colors. For this position the pyramid so that the edge with the missing two colors was back. If the item is a great color on the left side, then repeat algorithm: LP, PPR, DM, PP, VP, PP, VPR, PPR. If right, do this: PPR, PL, PP, DM, DMH, DM, VP, PL. The technique is one of the fastest and easiest.